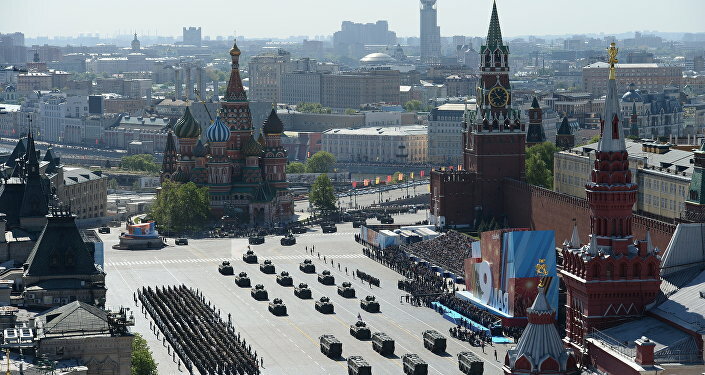 MOSCOW (Sputnik) — A military parade marking 71 years since the end of World War II began in Moscow on Monday with the introduction of the Russian flag and banners that were carried into Red Square. Three banner-bearer groups escorted by Russian Honor Guards marched through the central square carrying the Russian national flag, a copy of the Victory Banner that was hoisted over Berlin’s Reichstag in 1945, and the banner of the Russian Armed Forces. Drummers from the Moscow Military Music School signaled the beginning of the annual parade, overseen by Russia’s Land Forces Commander-in-Chief Col. Gen. Oleg Salyukov. The nation’s Defense Minister Sergei Shoigu will be inspecting the parade. The number of military personnel taking part in the 2016 parade was scaled down from last year’s jubilee event 16,000 to slightly over 10,000.